Who Doesn’t Love A Panini? I have a story. Sit tight. Despite being divorced now for about 21 years, my parents remain on very good terms with one another. Always have. And still to this day they get each other Christmas/Channukah gifts. Sometimes I get recruited to help pick out presents for each side. This particular year took place some 5 or so years ago. Mom and I were walking around Costo feeling the cheer of partly the holidays but mostly free samples and she asked what I thought she should get my father that year for Christmas. We happened to be walking in the kitchen appliance aisle, and I saw a panini press. I had strangely wanted one for years. Because who doesn’t love a panini??? I think it’s a rather reasonable thing to lust after, and I had been. For a long long time. My father on the other hand would find no use for a panini press. He’s an old school cook and a no-frills guy in a kitchen. Well the great thing about my father is he will love any damn thing you get him. Seriously. He is so moved by the idea that someone thought of him long enough to get him a present, he will be taken-a-back by anything you wrap and place in front of him. Knowing this, I decided to exploit it for my own benefit. Because apparently none of my father’s good heart has rubbed off on me at any point in my life. Sure enough, Christmas day comes, pops unwraps the press and genuinely loves it. Takes it out of its box, puts it in a prominent spot in the kitchen and doesn’t touch it once. I, however, used it many times and when the time came for me to move out- I took the sucker with me. Thanks, dad! Now after that long story, I realize that probably not many of you have conned your nice, un-expecting parents into buying weirdly specific kitchen appliances, and I swear to you that was the only time I can remember doing that. I probably haven’t done it since. 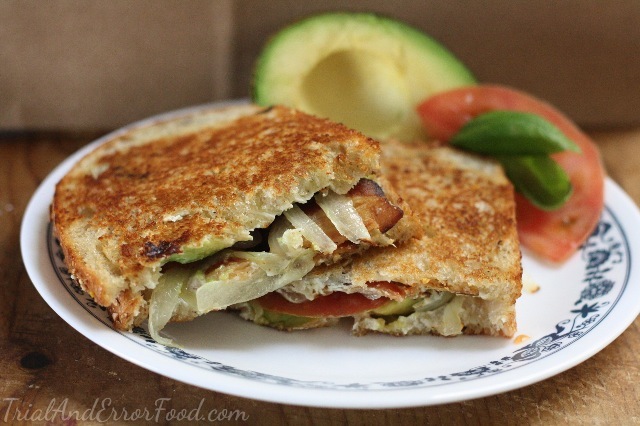 So not only do I have a delicious panini recipe for you to enjoy, but I’m happy to say it involves a no-thrills method using only things you already have in your kitchen. Let’s get to it! Make sure to click on the orange drop down box at the end of the post for the recipe! 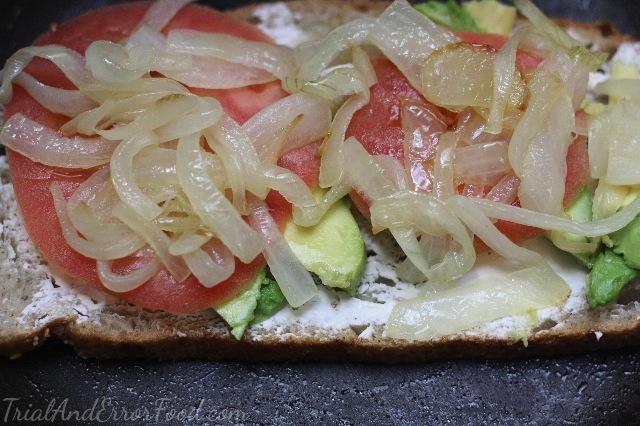 You will need- good sourdough bread, some bacon (of course), big ole juicy tomato, an avocado, a yellow onion, some good quality goat cheese and a little olive oil and butter (not pictured, they had better things to do). 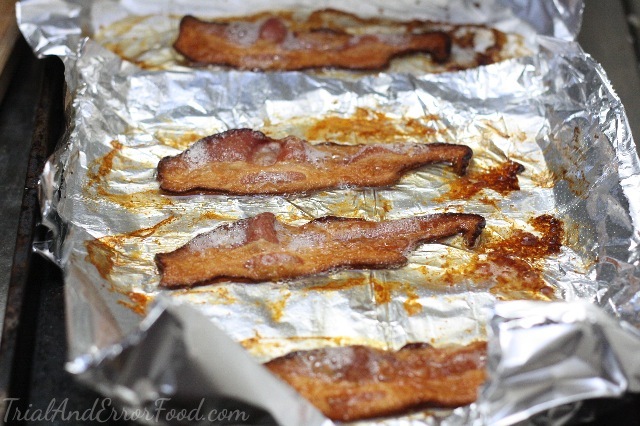 Lay yer bacon out on a cookie sheet to bake. It’ll let you multi-task better. Pop the bacon in a 375 degree F oven and keep watch until it’s golden and bacon-y, at least 20 minutes, possibly more depending on how you prefer your bacon. I like mine extra crispy so I probably had it in for about 30 minutes but every oven is different so make sure to check regularly. 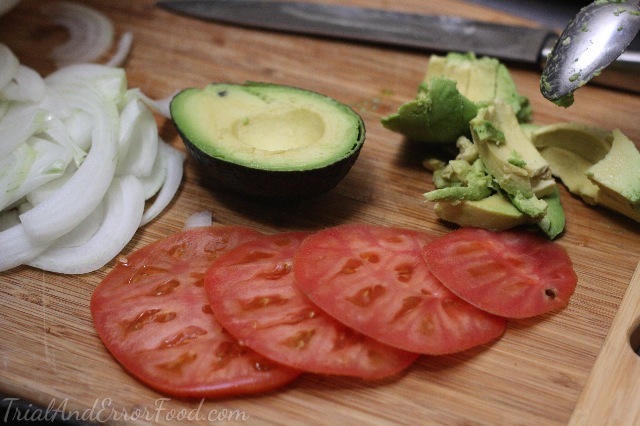 Slice up your onion, tomato and avocado. 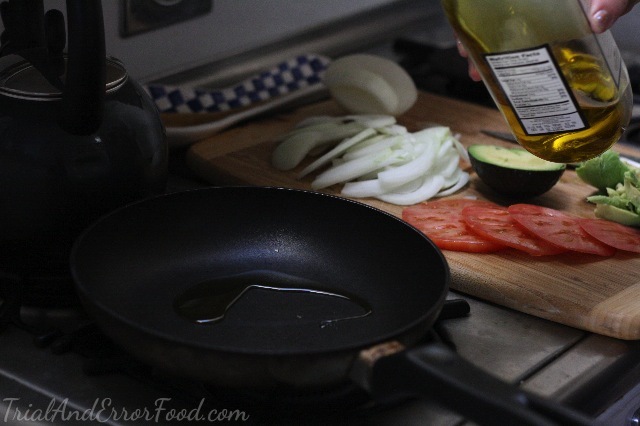 Heat up some olive oil in a skillet. 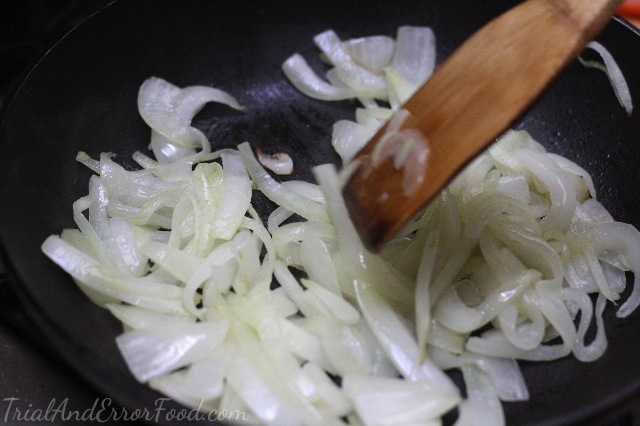 And on a lower-medium heat, spend some quality time with your sliced onions. You want them to get soft and sweet and grilled, not charred so it’s going to be a slow, lengthy process but take your time with it. Once they’re all cooked up, place in a bowl and set aside. It should be about time to take the bacon out. So lovely. Hooray! Almost everything is fully prepped! Now to butter the bread. Butter just one side of each slice. 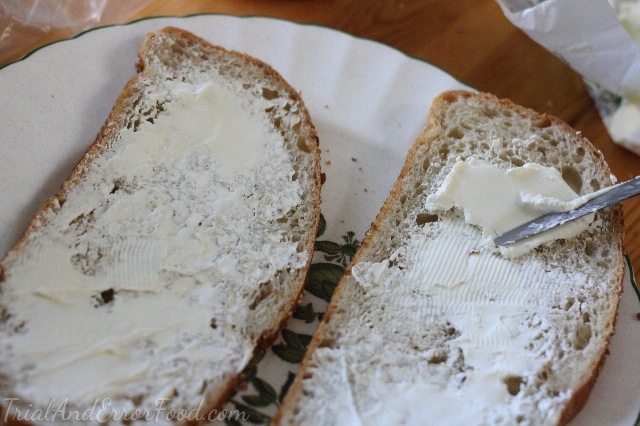 I assume you can all butter bread, but if not, I’ve included a picture above. On the other side of each slice, spread on the goat cheese. Possibly one of the best substances on earth. You can use a new, oiled skillet, but I thought the grilled onion taste would be super flavorful to grill the paninis in, so I just plopped the bread-slice butter-side down into the pan and began layering. 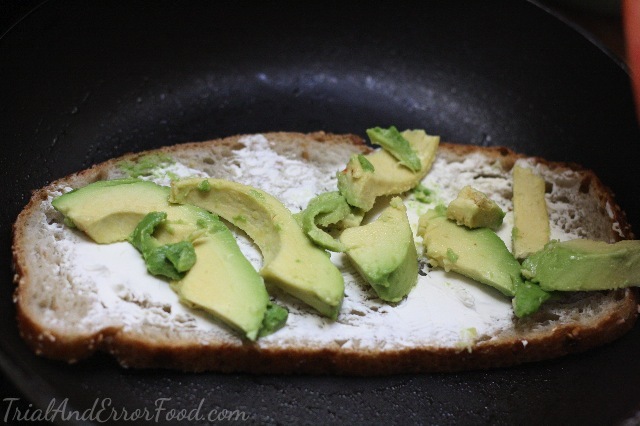 Start with your avocado. your bacon. You cannot go wrong here. How mouthwatering does that look? It’s the bacon effect. Top with the other slice of bread, making sure the butter side is facing up this time. 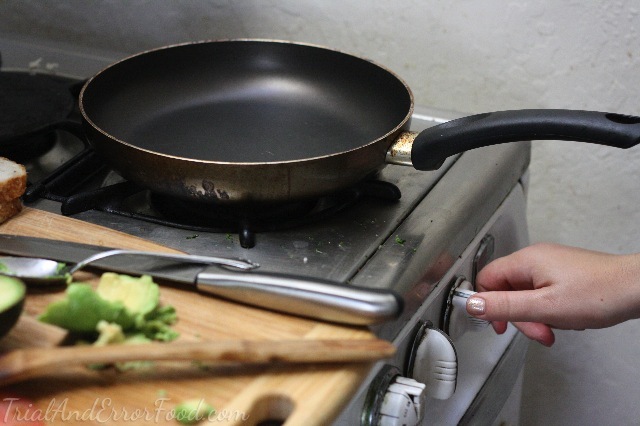 On another burner, heat up a clean skillet and fish out some cans from your cupboards. Place the heated pan on top of the sandwich and weigh down with the cans. Super fancy, huh? Oooooh yes. 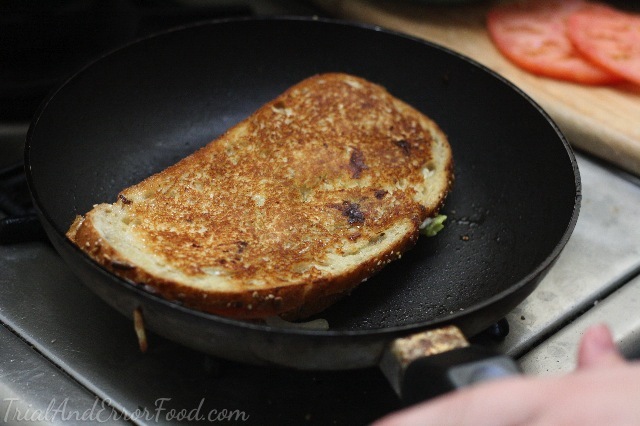 Wait a few minutes until the bottom of your sandwich is golden brown and flip. Cover again with the other pan and weigh down with cans. Cook for another few minutes until the other side is golden brown. Who doesn’t love a panini? A simple hot meal, combining a few simple delicious ingredients and forcing them to merge as one. How can you go wrong? Happy eating! 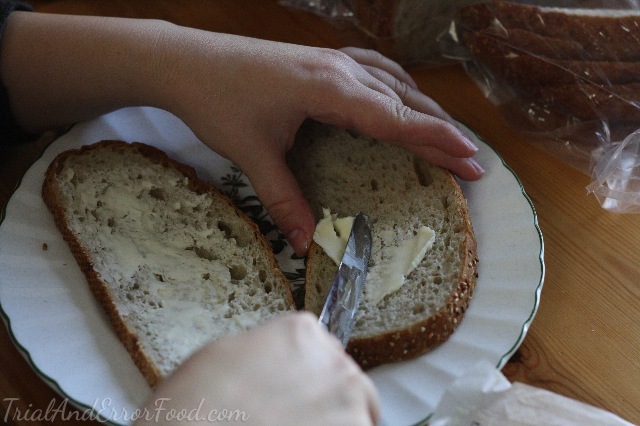 butter for the bread- I don’t have exact measurements, sorry! 2. 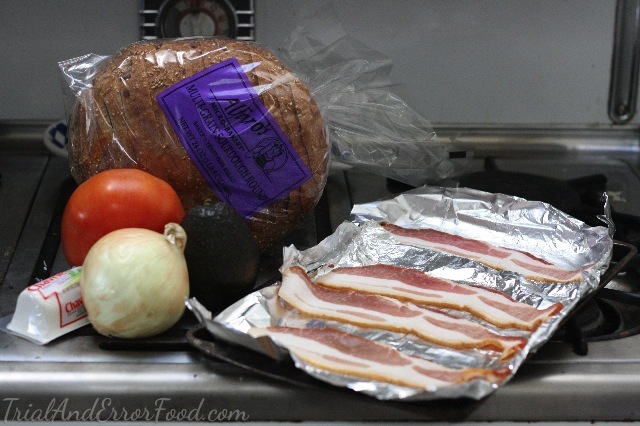 Prepare your bacon on a cookie sheet. 3. 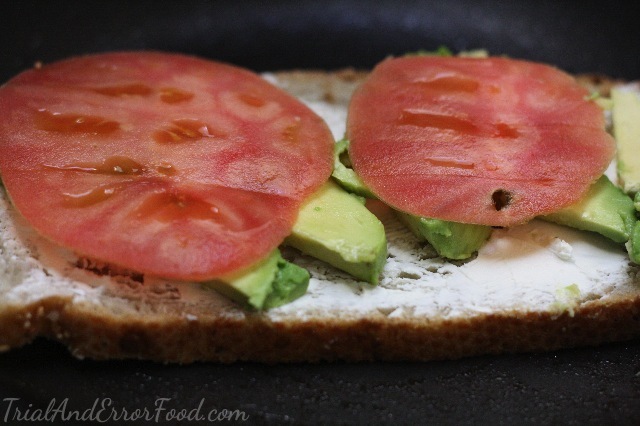 Slice tomato, onion and avocado. 4. Put yer bacon in the oven and let it cook for at least 20 minutes, or until it’s dark and golden and bacon-y. You know what I mean. 5. 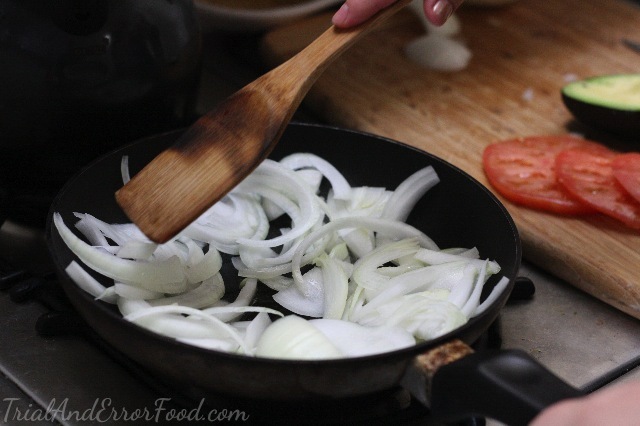 While the bacon is in the oven, drizzle the olive oil in a pan and throw in the onions. Cook on a lower medium heat so they grill slowly. Set aside. 6. Remove bacon from the oven once it’s done. 7. Butter one side of each slice of bread, spread the goat cheese on the other. 8. Lay the bread in a heated skillet, making sure the butter side is down. 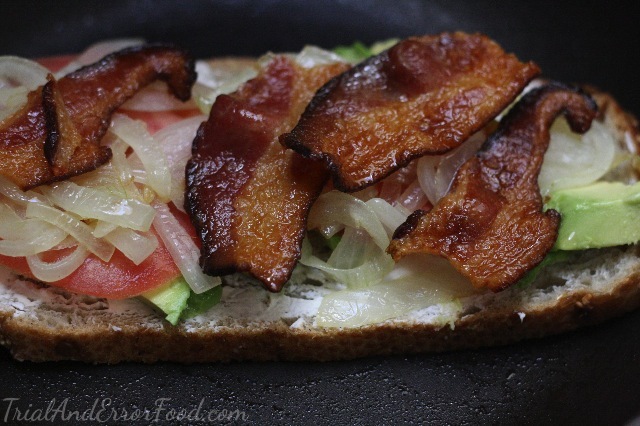 Layer avocados, tomato, onion and the bacon. Top with the other slice of bread, keeping the butter side up this time. 9. Heat the bottom of another skillet on the stove. Once heated, place on top of the newly layered sandwich. Top it off with a couple of cans to weigh it down. 10. Grill for a few minutes on each side until the bread is golden brown and everything is melty and delicious on the inside. 11. Grill up the other sandwich and enjoy with a friend! « The Reason I’ve Been Neglecting All Of You. 2 comments on Who Doesn’t Love A Panini? I love this post, truly—desperately love panini! Luckily, here in Santa Cruz, we have a great restaurant that specializes. Your post and photos are inspiring. 1) I have cooked bacon in the oven, and I turn my two or three times. I didn’t see mention of that, and wonder if you do. BPA is especially dangerous for young people—and their reproductive systems. And in so many other ways. That said, thank you for writing this delicious post. I’m happy to see you’re using Alfaro bread, too. Even though he sold the company years ago, Richard Alfaro is one fabulous person, and I’m happy to call him my friend. YA GOT GOOD TASTE! Hey Tana! Thanks for the reply! 1. I’ve actually never turned my bacon while baking and it seems to come out great every time. Probably since it’s not really a thick slab of meat, the baking sheet heats up well enough to cook both sides at the same time. But- as cooking goes, there’s about a billion different ways to cook any one thing, so if flipping is a preferred method I’d say stick with your guns. 2. Thanks for the head up and concern!! 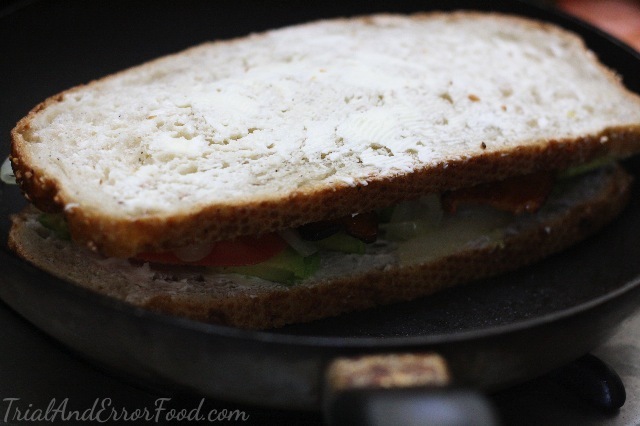 I actually cook at my friend’s house when I shoot for this blog, and I just grabbed a random can to weigh the sandwich down, but hearing about that saddens me!! 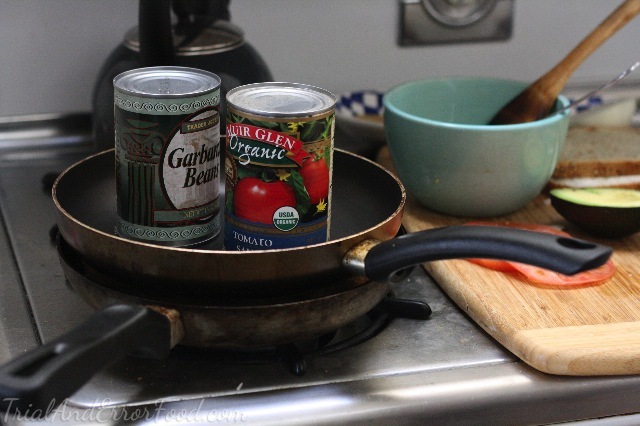 I love cooking with canned tomatoes. Maybe I’ll do a can-you-own tomatoes post! !